Air pressure increases slowly from zero at the boundary of space to one atmosphere (14.7 psi) at sea level; water pressure increases much more dramatically, adding one atmosphere of pressure for every 33 ft of seawater. The concentration, or "tension," of dissolved inert gas within your body's tissues is a function of ambient pressure — that is, the pressure of the environment surrounding you at any given time. The inert gases that are not used in your body's metabolic reactions normally exist in equilibrium with your ambient environment — in the same concentration as in the air around you. Tissues under such conditions are described as "saturated." Minor pressure changes, such as those created by shifting weather conditions, produce minor pressure variations in atmospheric gases that are then matched by pressure changes in the gases in the body's tissues. When a pressure difference, or "gradient," is created, molecules from the area of higher concentration flow toward the area of lower concentration until balance is re-established. Since all of us constantly experience minor changes and corrections of this nature, the gas tension in our bodies is in a state of dynamic, rather than static, equilibrium — even before diving is added to the equation. 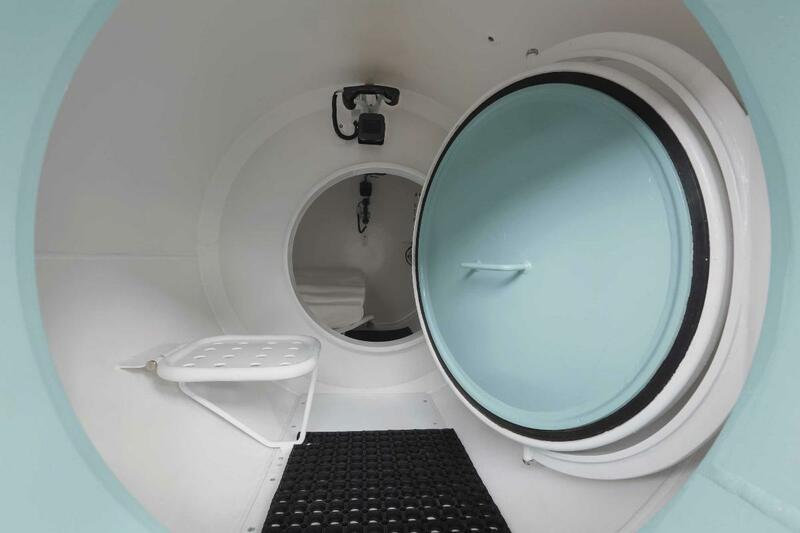 The diving environment puts a significant additional burden on this adaptive mechanism. Here's why: Pressure is measured using a unit known as an "atmosphere." There is no actual physical boundary between the Earth's atmosphere and space, but the atmosphere is often considered to extend 62 miles (100 kilometers) from sea level to the edge of outer space. The pressure produced by this entire column of gas acting at sea level is one atmosphere, equal to 14.7 pounds per square inch (psi) or 101.3 kilopascals (kPa). By comparison, the change in pressure underwater increases by one atmosphere for every 33 feet of saltwater and every 34 feet of freshwater. 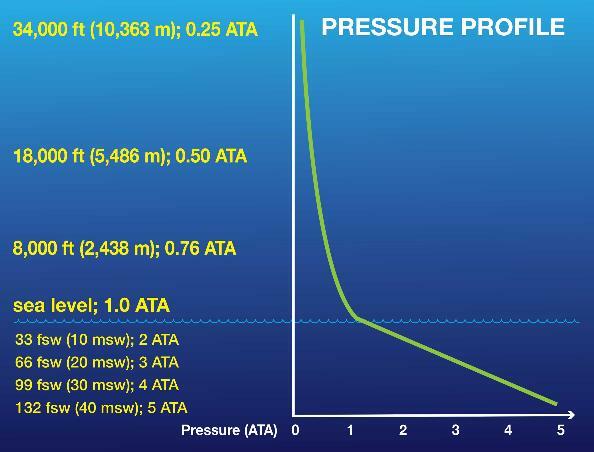 As a result, any variation you experience in surface atmospheric pressure is extremely modest compared with the variation in pressure you can undergo when you travel vertically underwater; this can create huge gradients in the uptake of gases during your descent and in their elimination during your ascent. Your lungs serve as the primary connection between your body and the environment in which you are situated at any given time. When you expose yourself to increased pressure underwater, the gas in your lungs is compressed. This creates a gradient from your lungs to your bloodstream and, subsequently, from your bloodstream into your tissues as they are perfused, or supplied, with oxygenated blood. Your tissues will take up inert gas until the gradient is eliminated, an effective state of equilibrium, or saturation, with the surrounding environmental pressure. It takes a long exposure for complete saturation to be reached, but once reached, staying longer does not further increase gas uptake or the required decompression.